If you're thinking that the much-coveted car is more dramatic symbol than status symbol, you'd be correct. In this case, the Jag represents those bucket list projects that keep many of us going. 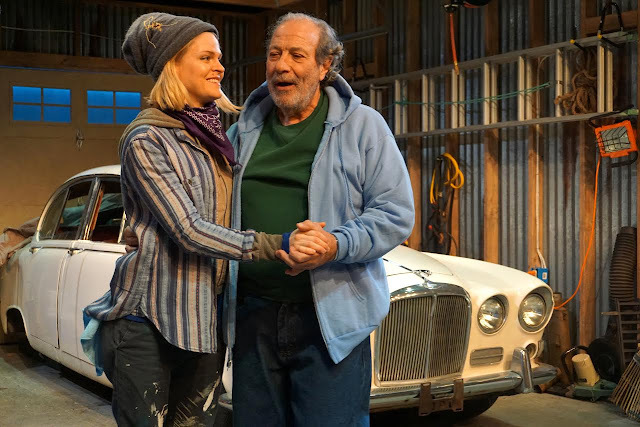 The play is set in a suburban garage where Leo (nicknamed Chick) and his son Donald (dubbed Bone), work to restore the car with local jobber Carla. Irascible Chick has lost his sight from macular degeneration and must rely upon Bone and Carla to help him finish the project he started with his now-deceased favorite son, David. Bone is eager to finally sell the car to pay off some serious gambling debts. As you might guess, the fuel this JAG runs on is a tankful of high test friction between Chick and Bone. Although some might say that the car is the play's fourth character, it is actually dead David who's presence looms large in the garage, completing the mechanics quartet. If this were a farce, it might facetiously be titled “My Brother the Car,” but it's not that sort of play. That's not to say it isn't funny, (Chick: “I'm not an alcoholic, I'm a drunk. Alcoholics go to meetings.”) but THE JAG is more a well-written character study with revealing spurts of wry humor than an out-and-out comedy. Driving THE JAG (forgive the pun) is veteran director Brendan Burke, who has assembled a fine cast. As Chick, Dan Grimaldi is convincingly blind as well as convincingly gruff. Christopher Daftsios' Bone offers a nice mix of quiet sensitivity and masculine (Italian-American) pride. The dynamic created between Carla and Chick, however, becomes increasingly fascinating and truly unique. The brief stage time they share makes us long for a second act that further develops this odd couple. If Dilorio expands THE JAG beyond its 90-minute running time, let's hope this pair are in the front seat. As it is, THE JAG is still a satisfying theatrical joy ride.